Here at Baywater Farms, one of our specialties is the process of hydroponic growing, including our delicious microgreens! Here at Baywater Farms, one of our specialties is the process of hydroponic growing. What crops can we grow through the magic of hydroponics? Some of our freshest offerings throughout the year! For example, take a look at our Bibb lettuce. 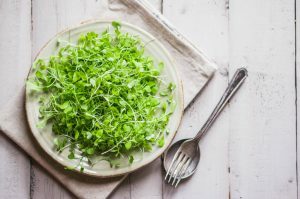 We also offer spring mix, specialty lettuce, herbs, and microgreens – so, if you’re wondering what hydroponic means, and how it works, just keep reading! A plant tray provides water and nutrients. The conditions will vary depending on what you are growing. As the crops grow, you might need to add supports so they can remain upright. There are several configurations for a hydroponic growing setup. You could use grow trays and nutrient pumps that release the nutrients the plants you’re growing need. Another method is to let roots hang free without support, but the problem with this technique is that misting the nutrients onto the plants might not always work; if it’s not done right, the roots can easily dry out. So, what’s next? However you decide to establish your hydroponic system, you need to be able to sustain your plants. What this means is ensuring that all nutrients are supplied in proper amounts at just the right time. Produce and plants alike need enough light to grow, especially since photosynthesis is more efficient with more sunlight available. With fall in season and winter on the way, getting the sunlight you need can be tricky. Make sure enough water, oxygen, and minerals reach the plant or the crops. Because there is no soil involved, you won’t have to worry about insect attacks. Keep an eye on your produce and ensure it is growing as quickly as it should be. The hydroponic growing method can improve the overall yield of the crops you’re raising because of the higher amounts of nutrients you are introducing into the system. However, you still need to watch out for other risks – that the plants are getting enough food and that the water doesn’t become contaminated. This entry was posted on Friday, October 13th, 2017 at 9:38 am. Both comments and pings are currently closed.